You are here: Home / DIY / My Mad DIY Skills: The Fiddle. I know you all thought that my DIY skills were just painting and decorating. Au contraire! I am going to teach you how to make your very own fiddle! OK, it’s not a real fiddle. It’s a cardboard fiddle. My son is in the second grade musical tomorrow night and is the cat and the fiddle. The dude needed a fiddle and we were fresh out. As one might expect, he turned to me, his DIY mom. At first, I thought I could find a fiddle or violin at a thrift store for a song (ha!). But after casing my favorite thrift stores for a week or so, no luck. Not even a toy fiddle. I had to DIY this one. 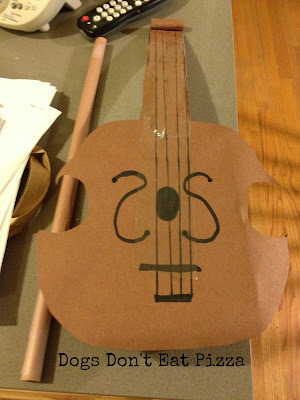 Next, I cut out the face of the violin/fiddle and glued that to the bigger side of the box. For the neck of the fiddle, I took a long strip of brown construction paper and glued rows of popsicle sticks to it. It took four sticks total, two whole and two cut down to about 3/4 size. Then I covered the top of that with brown construction paper. To make the thingy (technical term) at the top, I just rolled up some – you guessed it! – brown construction paper and glued it to the neck. Let dry. This is hard, because no doubt your cat/fiddler/second grader is going to want to test it out. Tell him to resist. It’s worth the wait. Once the glue dried, then I drew the face of the violin and the strings. I just used a Crayola marker and a ruler to do this. Then, I covered the neck (and, for good measure, the rest of the strings) with clear packing tape, just so that they didn’t smear or rub off in the magic of the musical. For the bow, I took apart a pants hanger you get at the cleaners. I used the rod from that, and just rolled brown construction paper around it, affixed with clear Scotch tape. It took about two sheets to cover it and to keep the roll thin, cuz you can’t have a bulky bow, right? And voila! You’ve got your very own fiddle. Tomorrow, I get to make cat ears from gray felt. I don’t sew. Wish me luck. Impressive! I love the fiddle and bow – would never have thought of it. I’m sure your cat loves his fiddle and is proud of his mom and her mad DIY skills!